The Rom is composed of several parts containing all the necessary information and data that the Android device needs in order to function. A ROM image is the data file that contains the information of the device. The ROM image is specific for every Android device and it helps at starting the device and running the Android OS on it. Besides the ROM image, a ROM also contains other parts such as the graphical user interface (GUI), applications and the kernel. What is an Android kernel? As I said earlier, the kernel is just a part of the ROM. 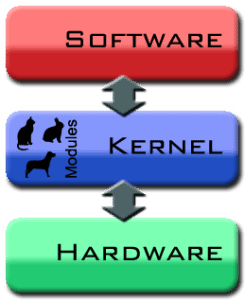 More precisely, the kernel is basically the part that makes to link between hardware and software. Of course, it is a lot more complicated than this. Kernels have been used in more devices than you can imagine, so it is not something unique for Android. Most operating systems use a kernel actually, including Windows and iOS. Android uses the Linux Kernel, modified and developed in such a manner that it functions with Android. 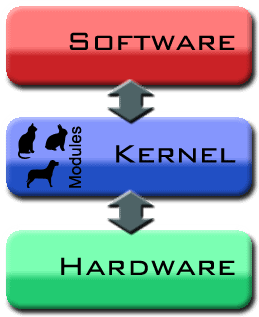 So, the kernel makes the link between hardware and software. This means that each time you give the phone a command to do something, the kernel is the one to give the final order to the OS. For example, you want to open the menu window on your device. When you press on the menu button, the request is sent towards the OS, and from there it gets to the kernel. The kernel analyzes the command it got and using the specific coding it is based on, it knows that the menu window has to be opened and thus opens it. The kernel is very important when developers create applications. They have to write them in a way that the operating system understands so that the kernel can communicate with the hardware. The kernel gets activated during the bootanimation that you see when you turn on the device. By following a series of scripts, the device loads the kernel and parts of the OS that are necessary. Think like this: without the kernel there was no other way for developers than to create source codes for every piece of hardware that your device has. The kernel eases this by communicating itself with the hardware, so that developers only have to work with the kernel. It is quite complicated to understand what a kernel is, but as long as you don’t decide to become a developer, you should care so much about the kernel or how it works. If you have any other kernel related question, please write them in the comment section below and we’ll try to answer as soon as possible.